My husband and I don’t seem to be able to visit Wales without dedicating a day to Hay-on-Wye and all its beautiful bookshops! This time, myself and ‘bump’ prepared ourselves for much walking and browsing, with the blessed relief of comfy reading chairs along the way . . .
Hay Castle has a dignity and vibrancy about it in the autumn. I have to say, one of Hay-on-Wye’s most famous bookshops, Booth’s, offered a particularly cosy armchair, which helped to sooth a pain on my right side. Of course, I had my nose in a good book – ‘A Week in December’, by Sebastian Faulks, to be precise. Afterwards, I bought it, clutching my Booth’s bag, as Hubs and I dashed out into the rain and soon found ourselves in a charming shop that sells ornaments, toys, cushions, walking sticks and umbrellas. We seized the opportunity to invest in a large umbrella, picking out a cheerful blue and check design. I also bought an owl cushion for my mum. For any owl fans out there (and I’m sure there are many of you) – the shop does a wide range of owl-inspired items. I bought a lovely keyring on my previous visit. It was off to ‘The Granary’ for lunch. They serve a variety of hearty soups, perfect for a less than sunny day, and also offer milkshakes and presses, (two of our favourite beverages)! The cakes and desserts are lovely too, but we were saving room for an ice cream later on, so contented ourselves with a simple, but flavourful, hot meal. 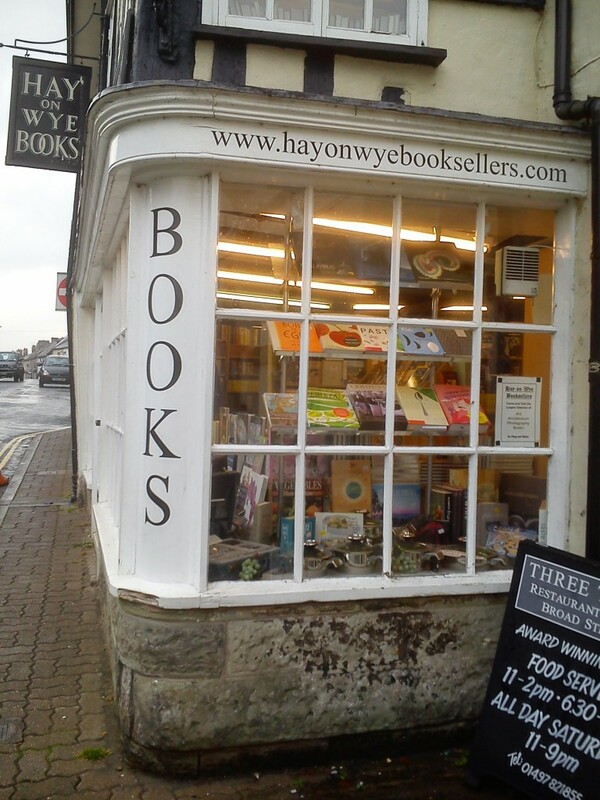 Hay-on-Wye Books was our next destination. This shop provides an especially good selection of informative books, on subjects such as: interior design, cooking, lifestyle, etc. We picked up a book full of ideas for Halloween and I found a recipe book, containing some chocolate based recipes that I had enjoyed making in the past, and had lost over the years. The book also includes some new and yummy recipes, including one for chocolate fudge. It looks so simple, it would be a crime not to make an attempt at it! We always visit Hay-on-Wye Books when we’re in town! We paused outside the store to review our purchases and take a couple of pictures (as shown above). 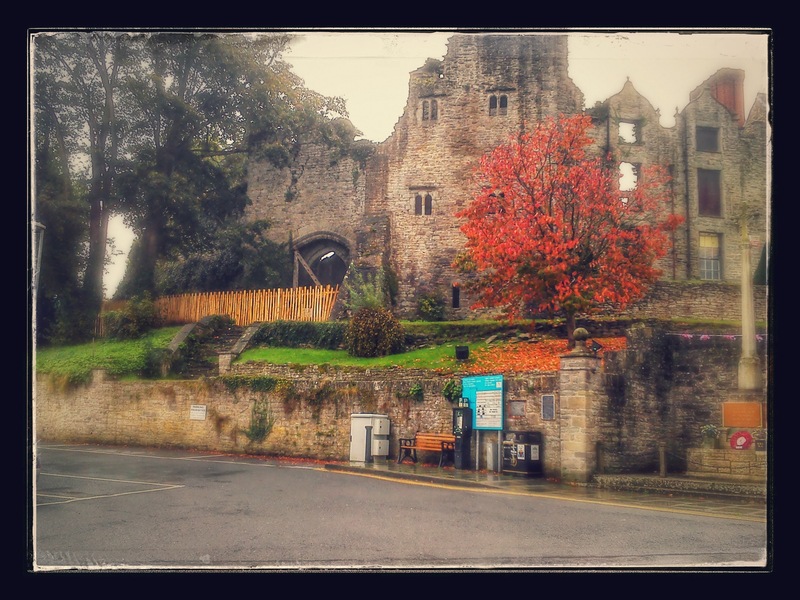 Hay Castle is stunning in the autumn, as it basks in russet leaves and stoically prepares to brave the colder seasons. Of course, the day wouldn’t have been complete without an ice cream at ‘Shepherds’ and a stop off at ‘The Honey Cafe’, in Bronllys, for an all day breakfast. Talk about comfort food! So, it was with heavy stomachs, and numerous bags of purchases, that we finally went home, eager to discuss the day with my Mum and Dad. I can’t wait until the next visit, when I will hopefully get to introduce my baby son or daughter to the delights of Hay!